I love good historical fiction, especially when it features people of colour. I "discovered" Piper Huguley's work earlier this year and fell in love with her characters almost immediately. Like Beverly Jenkins, the queen of historical fiction, Huguley does her research, recreating towns and characters of days gone by. Fans of her Migrations of the Heart series might think it strange that I start my review of the series, thus far, with book #3, but its story line is the one that has drawn me in the most. The Bledsoe sisters are well known in their neck of the woods in rural Georgia. 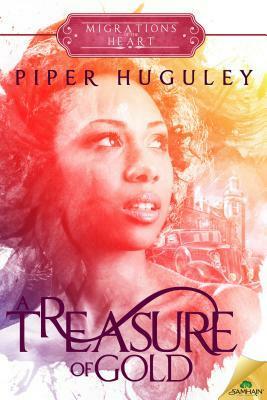 Just as her sisters Ruby and Pearl have done before her, Nettie leaves the country and heads for the big city, Philadelphia, Set before the depression in 1923, A Treasure of Gold is a delightful story that can either be read as part of the overall series or as a standalone book. The most devout of her sisters, Nettie arrives in Philadelphia to help care for Mags (aka Pearl) who is due to have a baby any day. While she awaits the birth of her newest niece or nephew, she stumbles upon an injured man right outside of Ruby's door. Since Ruby's husband, Adam, is a doctor, it would only seem right that he doctor on the handsome stranger. But Adam and Ruby both have an adverse reaction to their new patient, Jay. Nettie's Christian duty won't allow her to turn a cold shoulder to Jay or his young daughter, Goldie, and before she knows it, she's taking care of both of them and the tongues down at the local church are wagging. So this is the part that threw me, and had it not seemed so out of character for the characters I'd come to know and love, I wouldn't have questioned it. Jay is a numbers runner, not necessarily an honorable profession, but he wasn't a gangster either. With Ruby and Mags both coming from humble beginnings, and Ruby herself being subject to judgement and ridicule back home, I expected more of them. Both were rigid in their dislike of Jay, as were their husbands. On the flip side, Mag's mother-in-law, who was so cold in A Most Precious Pearl that ice wouldn't melt in her mouth, loved Jay. I also didn't care for the way Nettie's whole family treated her like damaged goods. It was all very strange, almost as if the author either forgot the character's personalities or decided to create completely new personas for them. That aside, I loved this book for a number of reasons. As I said before, Huguley does her research. She captures the essence of Philadelphia during the Roaring Twenties. I found it to be much more interesting than the small town country living previously featured in the series. I also like that while she makes no secret of her character's being Christians, she doesn't try to beat readers over the head with it as some Christian authors are wont to do. And lastly, her romances involve actual courting. No one is jumping into bed with anyone any time soon. If that's your thing, you're going to want to find another author. But if you appreciate reading about a couple taking time to discover each other, Huguley is for you. Definitely give this series and her Home to Milford College series a try.